What is the difference between the item, prefetch and html caches? It is my understanding that there are various different caches in Sitecore. "Each database prefetch cache entry represents an item in a database. Database prefetch cache entries include all field values for all versions of that item, and information about the parent and children of the item. Populating the prefetch cache results in smoother user experiences immediately after application restarts. Excessive use of prefetch caches can affect the time required for application initialization." This cache is to minimise the round trips to the database, it again pulls item information from Sitecore but the difference being it does it when the item is requested (rather than start-up of the site); it will pull the data from the pre-fetch cache if it's there or go back to the database if not. Some of these references are a bit old, but I don't believe this part of Sitecore has changed that much over the years. Database prefetch caches contain items that Sitecore accesses during and immediately after initialization, and items with children that Sitecore often accesses as a group. Sitecore populates database prefetch caches at application initialization, and maintains those caches over the life of the application. Each database prefetch cache stores data from a different database or data source. Not all data providers implement prefetch caches. Database item caches store items. Database item caches are dependent on database data caches, which operate at a lower level. Each entry in a database item cache represents a single version of an item in a single language. Sitecore does not pre-populate database item caches. The HTML cache (also known as the output cache) associated with each managed Web site contains the output generated by individual renderings under different conditions. 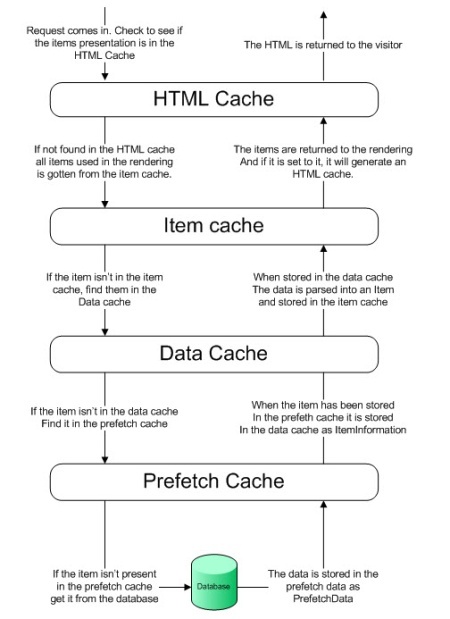 Each site HTML (output) cache is dependent on the database item cache. Not the answer you're looking for? Browse other questions tagged caching or ask your own question. What does the DisableBrowserCaching setting actually disable? What is the Sitecore.Caching.CachePriority enum type used for? Why is Prefetch data(master) cleared by DefaultScavengeStrategy?